Greenpeace commissioned some of the world’s leading experts on nuclear waste to produce an overview of the current status of nuclear waste across the world. As the nuclear industry continues to struggle to compete in the rapidly evolving global energy market, the toxic legacy of decades of nuclear reactor operation and all the waste that continues to be produced to support it, remains a central element in any debate on the future of nuclear power, including decisions on nuclear reactor phase out. For every year of nuclear reactor operation, nuclear waste volumes across the world will continue to be generated. Without exception, all countries reviewed were found lacking a no sustainable and safe solution for managing the vast volumes of nuclear waste. This includes high level spent fuel produced in all nuclear reactors, for which to date all efforts to find secure and safe permanent disposal options have failed. Focusing on 7 major nuclearized countries (Belgium, France, Japan, Sweden, Finland, United Kingdom and United States), it shows that the multiple stages of the nuclear fuel cycle produce large volumes of radioactive wastes; and that no government has yet resolved how to safely manage these wastes. The conclusion of the report is clear: underground repository research has failed as a solution. Spent fuel pools are used to temporarily store the fuel from nuclear reactors. After irradiation in a reactor core, the fuel is still very hot and radioactive. It needs to be cooled in the water of these ponds, which also provides shielding from radiation. After a few years, a tiny part of this fuel will be “reprocessed”, while the remaining fuel waits for a final storage solution. Independent experts who contributed to the writing of this report reviewed nuclear power plants in France and Belgium, and focused on the ability of spent fuel storage pools to withstand a malicious attack. Because it contains sensitive information about security at French and Belgian nuclear facilities, the report will not be released to the general public. It will be submitted by Greenpeace France, Greenpeace Belgium, Greenpeace Germany, Greenpeace Switzerland and Greenpeace Luxembourg to the relevant nuclear security authorities in order to alert them to the issue. Read the executive summary of the report in english here. The experts who participated are: Oda Becker (Germany), Manon Besnard (France), David Boilley (France), Ed Lyman (US), Gordon McKerron( UK), Yves Marignac (France), and Jean-Claude Zerbib (France). By Gabriele Mraz from the Austrian Institute of Ecology and Oda Becker, Independent Expert for the Risks of Nuclear Facilities based in Hannover. It is supported by the Vienna Ombuds-Office for Environmental Protection. While the effects of high radiation doses on humans (like acute radiation sickness) are documented quite well, the health effects of low radiation doses are still discussed highly controversially in radiation protection. Low doses result from nuclear installations during normal operation, from accident situations in nuclear facilities for workers and the public, from the nuclear bombs on Hiroshima and Nagasaki, but also from medical exposure and natural background. Based on new insights in health effects it can be concluded that the dose limits and levels in the BSS-Directive (Council Directive 2013/59/Euratom) and in the Food Level Regulation (Council Regulation Euratom 2016/52) are too high. They do not provide enough protection, especially for the embryo/foetus, children, pregnant women and young adults. The extended summary can be downloaded here: summary. In the Joint Project, European NGOs and research institutions cooperate since 2003 on safe and sustainable energy issues with a focus on anti-nuclear activities in Central and Eastern Europe. The long-term goals of the Joint Project are a nuclear phase-out in Europe, no new-build nuclear power plants, no renaissance of nuclear energy, no lifetime extension of old reactors, safe management of spent fuel and radioactive waste and adequate public participation. After more than two years of work the German commission on nuclear waste disposal (“Endlagerkommission”) in July 2016 released its final report. In February 2017 a translation of the summary of the report has been made available. The report focuses on the importance of the safety of a final repository and on siting issues as well as recommending a repository solution that is reversible. The report recognises the importance of transparency in information and public participation and ends by giving a number of political and social recommendations. There is within Germany from different sides still criticism on the operation of the Commission, which did not permanently exclude the Gorleben site, that has been considered for final disposal of German high-level radioactive waste, from future siting decisions. The Commission instead refers this issue to the German Government that is to draft a legal regulation on siting during 2017. This includes issues of transparency, among others about role of a strategic environmental assessment and related public participation questions. – Website “Aarhus Konvention”: http://aarhus-konvention-initiative.de. – Website of Friends of the Earth Germany BUND: “the search process for a repository site for highly radioactive nuclear waste – BUND’s criticism and demands”. A September 2016 report from the European Court of Auditors hilglights that Eight reactors across sites in three countries – Lithuania, Bulgaria and Slovakia –are years behind schedule in decommissioning and still require billions in funding. The decommissioning of these eight Soviet-designed nuclear reactors in Lithuania, Bulgaria and Slovakia was a condition for the countries’ EU accession. This special report No 22/2016 is called “EU nuclear decommissioning assistance programmes in Lithuania, Bulgaria and Slovakia: some progress made since 2011, but critical challenges ahead”: http://www.eca.europa.eu/en/Pages/DocItem.aspx?did=37685. The European court of auditors found that the EU funding programmes set up to assist with meeting this requirement have not created the right incentives for timely and cost-effective decommissioning. While some progress has been made, key infrastructure projects have experienced delays, and the critical challenges involved in working in the controlled areas still lie ahead. The EU auditors said the reactor buildings at Bulgaria’s Kozloduy, Lithuania’s Ignalina and Slovakia’s Bohunice had yet to be dismantled and no solution had been found for the disposal of spent nuclear fuel. Decommissioning costs vary according to the type and size of reactor, its location, the availability of disposal facilities and the condition of the reactor. The cost of final spent fuel depositories is also still largely unknown. By 2020, EU support should have reached 3.8 billion euro. According to the European auditors, the estimated total cost of decommissioning will be at least 5.7 billion euro. That figure doubles if the cost of disposing spent fuel once and for all is included. Other EU Member States face the same challenges. The report shines a spotlight on the challenges facing Germany and other nations within the bloc that are planning to retire their nuclear reactors. According to EU Commission data, only three out of the 91 reactors shutdown in Europe have been fully dismantled. The only repository for spent fuel being dug deep underground in Europe has been under construction in Finland for nearly 40 years and won’t be ready until after 2020. A working paper by the European Commission, seen by Reuters in February, showed that Europe was short of more than 118 billion euros needed to dismantle its nuclear plants and waste storage management. The IAEA recently published a new “Safety Reassessment for Nuclear Fuel Cycle Facilities in Light of the Accident at the Fukushima Daiichi Nuclear Power Plant”. On pages 27-30, there is a chapter on “Reassessment of Emergency Preparedness and Response”. Greenpeace India today released a report lead by Davidd Boiley, Director of ACRO and member of NTW. 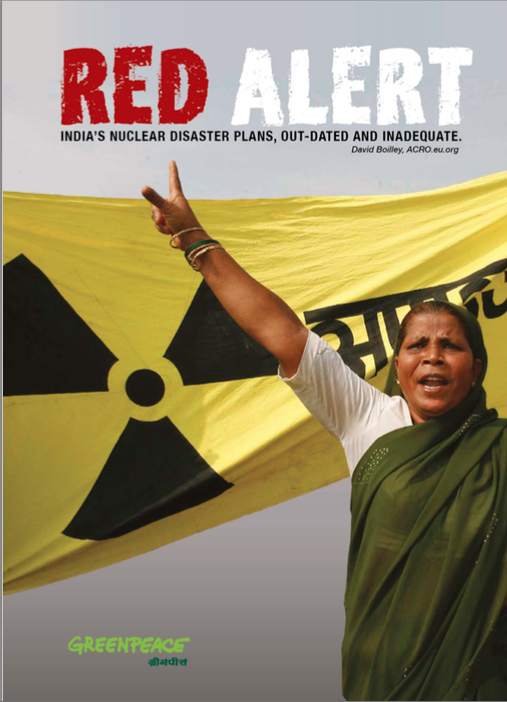 The report, titled ‘Red Alert – India’s nuclear disaster plans, outdated and inadequate’, assesses India’s nuclear disaster plans and concludes that India’s plans do not offer a complete defence-in-depth for existing nuclear plants. – The report examines differences with Fukushima and shows a lack of emergency preparedness and provides recommendations for the authorities to act upon. – The manual on emergency preparedness at Kalpakkam still has emergency guidelines from an ancient manual adopted in 1984, well before the Chernobyl disaster. – India’s acceptable limit of contaminated food are set dangerously higher than international limits. – The report also examined the weak learnings of the recent nuclear accident at Kakrapar Atomic Power Station (KAPS) and the lack of an Independent Nuclear Regulator. It took place in September 2013 in Slovenia on the topic “Nuclear Experts’ Perception of Lay Attitudes toward Nuclear Issues”. ABSTRACT From the previous research performed during last years it became clear that the attitudes, opinions and perception regarding nuclear issues in the broadest sense including topics like radioactivity and properties of radiation, influence of ionizing radiation on humans, functioning of nuclear facilities and riskiness of support activities (e.g. transport) differ very much between nuclear experts and lay people. As nuclear experts should be involved in communication with the public on nuclear topics it is important to understand their understanding of the public opinions, because this could influence their attitudes toward the general public and their way of communication with them. Study presents nuclear experts’ perception of lay public attitudes toward nuclear issues and reasons behind them. With the help of internet survey within the members of Nuclear Society of Slovenia the opinions of Slovenian nuclear experts were collected. Especial emphasize was devoted to the consequence of existing experts’ opinions regarding communication with lay public. Survey contain questions about different aspects of lay public knowledge and understanding of nuclear issues, ways of communication with the public, attitudes toward public participation in the decision processes, perception of the experts’ role in the process, etc. Download the results of the conference. Report “Defects in the Reactor Pressure Vessels of Doel 3 and Tihange 2″, new scientific study into problems at Belgian nuclear reactors Doel 3 and Tihange 2 (Belgium). In 2012, due to the discovery of numerous flaws in the reactor pressure vessels, these two reactors had to be switched off for several months. In 2013, both reactors were restarted but then on 26 March of this year were unexpectedly shut down again. Other urgent safety questions concerning the two reactors remain unanswered.